Hello everyone, I do hope that you are all well and happy. I have been having a lovely day in the comfort of my lounge, on the sofa stitching and watching movies on DVD. The weather has been unbelievably foul all week and today was no better so cosied up with cups of tea and my latest project. Very little crafting has been taking place here of late. What with all the travel and the fact that I have been working on some bigger projects and being super busy at work I have not posted a finish for some time which is very slack of me! I have been doing stuff but the Chinese Emperor cross sitch will take a long time and I have just finished an exchange piece that I only posted this week so will not be able to post about for a while. 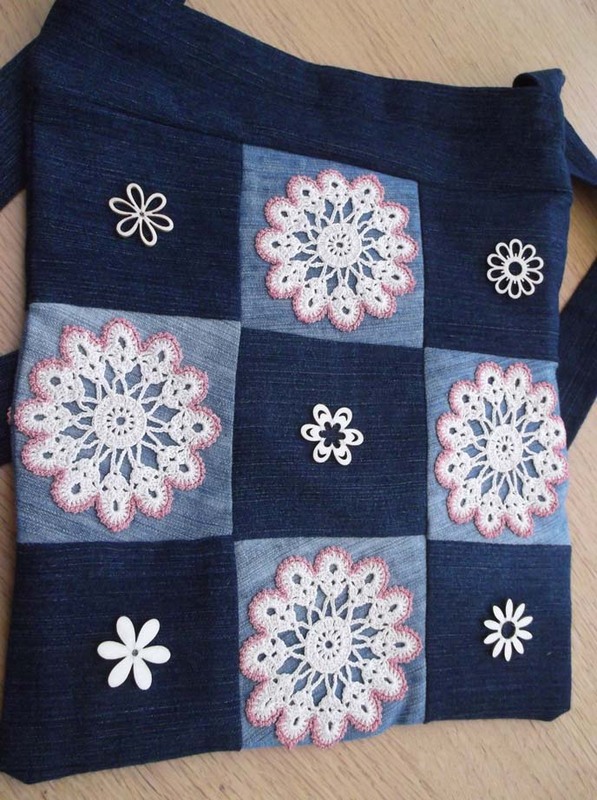 However the weekend before last I was seized with an urge to make something that has been an idea for a while – a patchwork bag made from denim garments that were no longer needed and some beautiful crochet table runners that I bought at a vintage fair a while back. 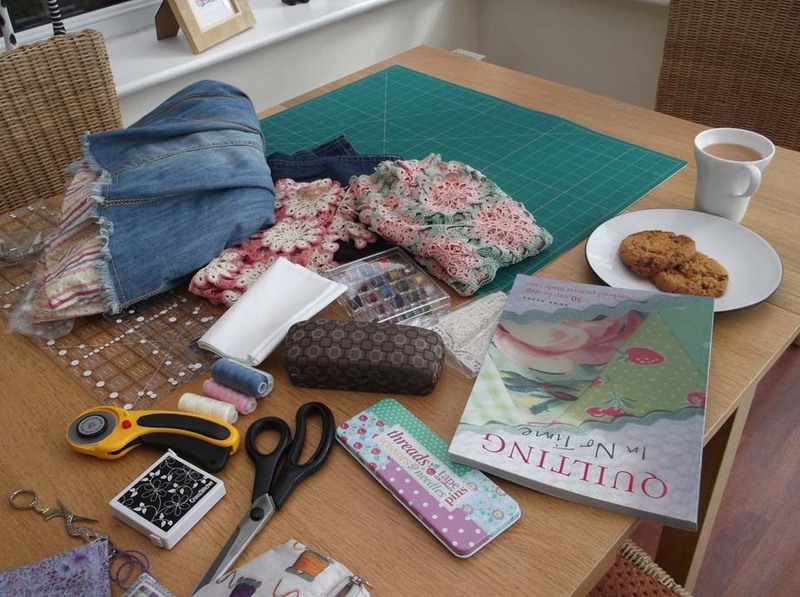 I had a lovely time playing with fabric and ideas – tea and cookies essential for the creative process of course! And finally finished it today.I am very pleased with the end result. I have added some wooden embellishments from a set I bought in Leeds last week to one side that I may add to the other once I see how well they last as they are quite fragile. 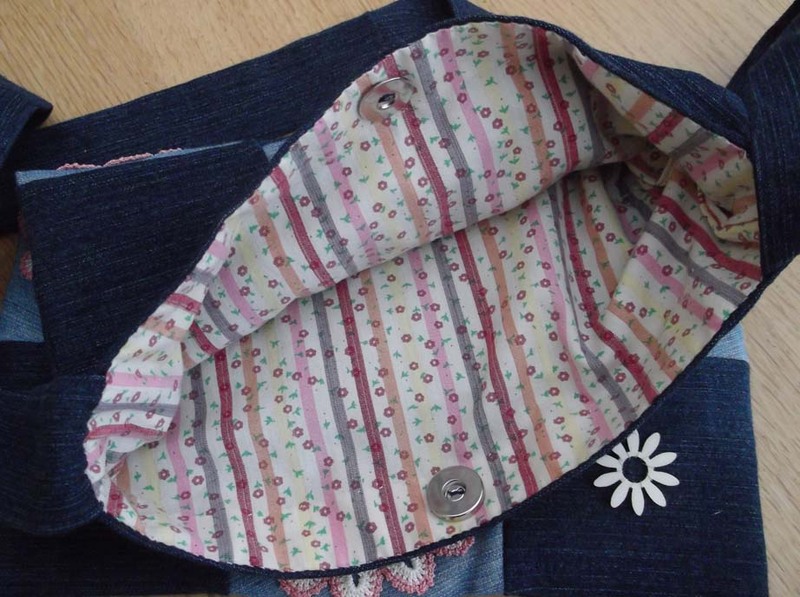 I am also very pleased with the lining , which is from one of Ellie’s old skirts , and I have used a magnetic button to fasten it.This was the most expensive bit of the whole project buying the buttons as everything else was from my stash. It is mostly my own design though I used various books for inspiration. Hope that you like it! I am really looking forward to next weekend as it is my first re-enactment event of the year. I am going to stay with my very lovely friend Kerry and we are going to join another friend Malcolm and his group at Bosworth Battlefield which will be very interesting as I have never been there before.Will take lots of pics for you! Yes I hope so – the weather was so bad here yesterday but it has been really lovely and sunny all day today, the sort of day that makes you want to be in a field. The event next weekend is just a day time one for us, we are not camping as my friend Kerry and I are visiting friend’s event, we will be in kit but will be staying at Kerry’s so I have a girlie weekend and re-enactment rolled into one which will be fab! Lovely bag and hopefully will wear well. Can’t wait for your next post – always interesting and inspiring. Thank you. Hello Jacky thanks for visiting and for your lovly comments. Glad that you enjoy the blog!